News was revealed last Friday on StarWars.com that the Star Wars Expanded Universe is no longer canonical. As discussed on the Star Wars Action News podcast covering C2E2 2014, the previous Star Wars continuity is being rebranded "Legends". Now a new Star Wars canon begins, with only the six Star Wars films and The Clone Wars TV Series considered gospel. This turns 23 years of novels, beginning with Timothy Zahn's Heir to the Empire into an extended "what if" scenario. Chewbacca was no longer killed by a moon. Luke was never Lando's wingman on the latter man's quest for a wife. Princess Leia never had three children (two of whom were later killed). And this also means Luke Skywalker never met, married, and had a child with Mara Jade. More, Jade never existed. All the retcons of this Force-strong female working in secret for the Emperor, infiltrating Jabba's palace, and later murdered by her nephew, are all now an alternate take on what happens in the Star Wars universe. With this rebranding all future Star Wars fiction, from books to comics to movies to video games, is being monitered by a Lucasfilm Story Group. Some characters and events can be cherry picked from the "Legends" timeline if future creators wish, but as of today we face a new Star Wars where Mara Jade is not only dead, she never existed at all. 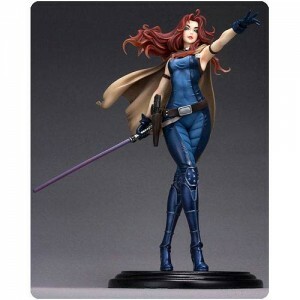 Which is why I placed my order today for the Kotobukiya Mara Jade Bishoujo Statue. And I highly suggest you do the same. Plus, if you haven't already, get Kotobukiya's first Star Wars Bishoujo statue, Jaina Solo. I have asked the reps at Kotobukiya about the Mara Jade statue on several occasions, most recently in February at New York Toy Fair 2014. It was at that event that Hasbro Vice President Daryl DePriest mentioned that his company was no longer allowed by Lucasfilm to make or rerelease characters from the Star Wars Expanded Universe. Given that stance I have been worried that Kotobukiya's second Star Wars Bishoujo statue may never see the light of day. Now scheduled for release within the next 30 days I do now believe Kotobukiya's Mara Jade will be released. However, given the character's deep love in the community (the well-known Star Wars book site Club Jade, is named after her), I now think this statue will sell very quickly. The Jaina Solo Bishoujo statue sold out from resellers and the price went up considerably on the secondary market. Realizing the demand for that statue Kotobukiya produced another run and she is now priced at $49.95 shipped on Amazon. But with the new status quo of the Star Wars Expanded Universe, wiping both of these characters away, I wonder: 1) Once these statues sell out, would Kotobukiya choose to do another run for a character that's removed from continuity? 2) If Kotobukiya chose to make more of these statues, would Lucasfilm allow them to continue to manufacture non-canonical characters? (Especially given that Hasbro cannot?) 3) If these statues, especially Mara Jade, become as rare and coveted as I expect, what will happen to their prices on the secondary market? Once before Kotobukiya produced a Bishoujo statue they were not allowed to make another run of--DC Comics' Catwoman. That statue, that originally retailed for about $65, is now over $200 on eBay. I can certainly see a similar fate for Mara Jade. And that is why I placed my order today, to ensure I received a Mara Jade statue from Kotobukiya's first shipment, securing her place in my collection. The Expanded Universe may reboot, but my fandom of those characters continues, and I want them represented in my Star Wars display. If you are fans of these characters, I suggest you do the same and order your Mara Jade today! Do you agree? Disagree? Will you be ordering the Mara Jade? Let me know in the comments below!